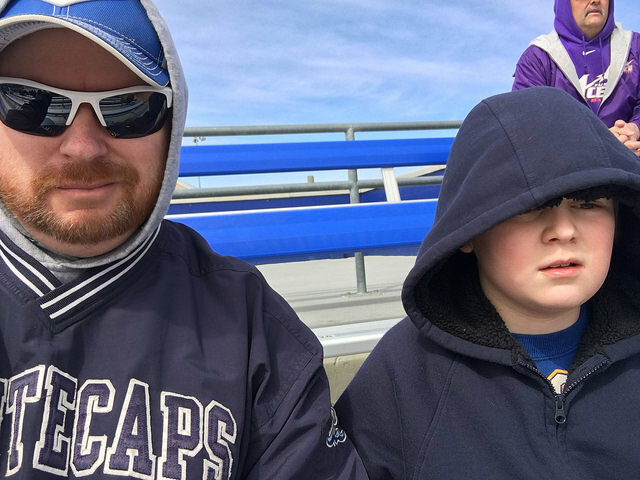 John Cropp Stadium-Lexington, KY: Our original plan for after our adventure at the Stache-A-Palooza, was to check out some Kentucky Wildcat baseball. 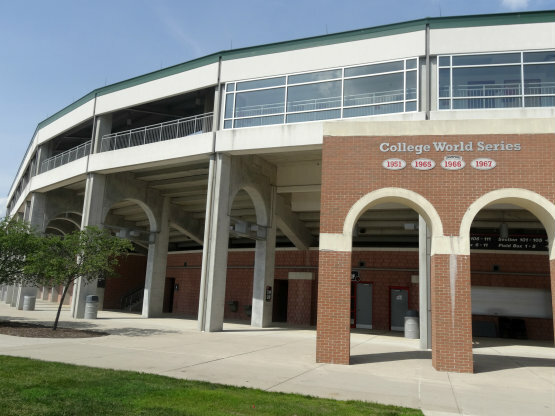 The team was scheduled to play Miami (Ohio) at 1:00 at Cliff Hagan Stadium. Uh, however, when we arrived at the Cliff, we found it empty, with no baseball teams in sight. Apparently, the game had been rescheduled, but we never saw any notification of this. Still not sure WHY the game was changed, the weather wasn’t as bad as the day before, but maybe because the UK basketball team was playing at the same time? 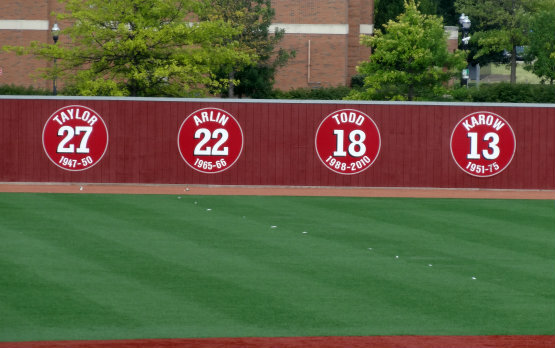 Personally, I think it’s stupid to re-arrange baseball for stupid basketball, but again, that’s just me. 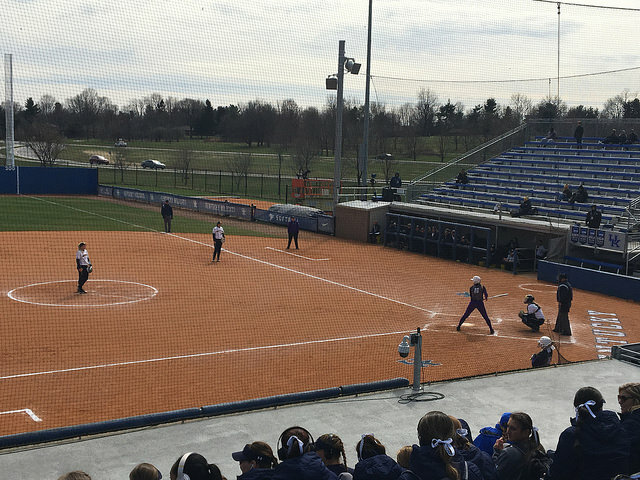 Not letting this ruin our day, though, we drove over to the UK softball venue, John Cropp Stadium, to find the ladies hosting a tournament there, aptly named the John Cropp Classic. The Michigan Wolverines were playing the Evansville Aces when we arrived, and it was cool to see a somewhat (old) home team on the field. We enjoyed the game, as the Wolverines made short work of the Aces. 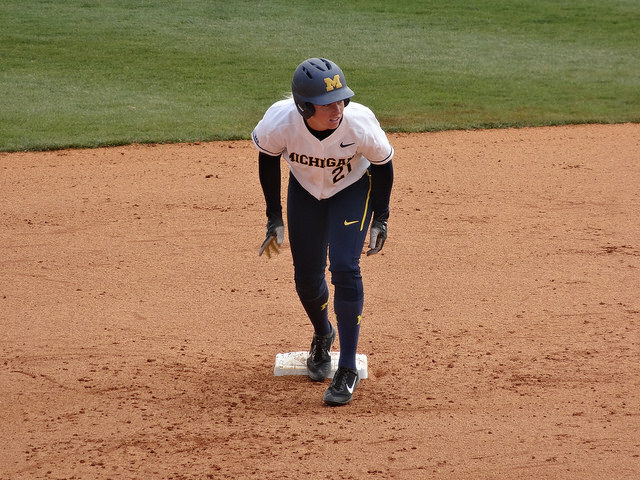 Final: Michigan 11, Evansville 2. 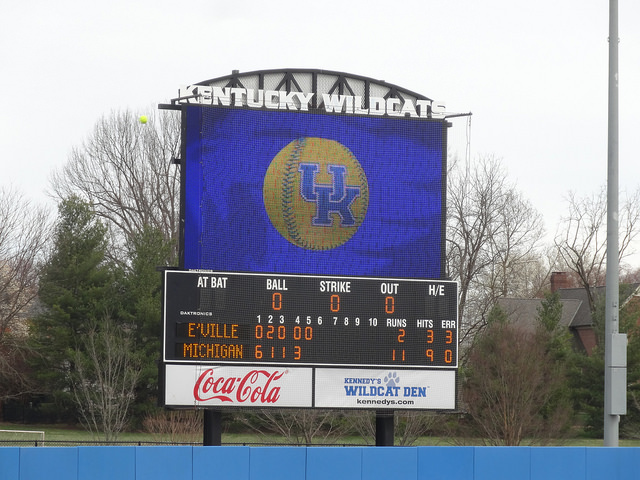 The next game in the tourney featured the home team Wildcats taking on the Kent State Golden Flashes. 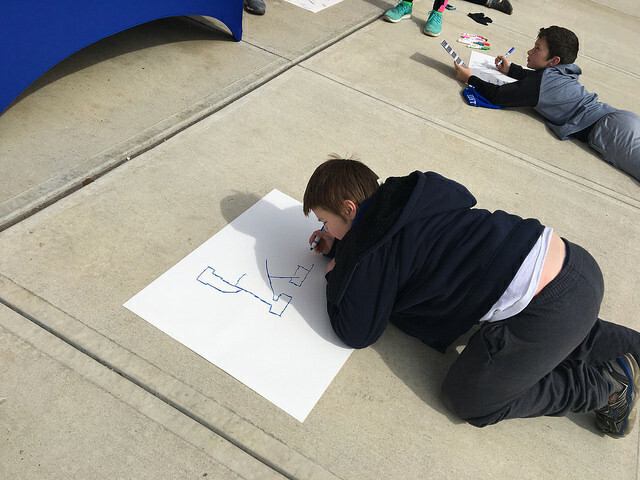 Between games, Brian and some of the other kids took time to make signs supporting their Kentucky team. Brian’s sign was a hit, as many of the girls acknowledged him, and one player even took a picture of him with it. To be honest, we only stayed a few innings as the cold was getting to us, but the home team ended up with the victory anyway. Not sure when we’ll make the trip to Lexington again, but will probably plan it around a Legends and Wildcats baseball game, and if the ladies are in town, we’ll hit another game here, too. 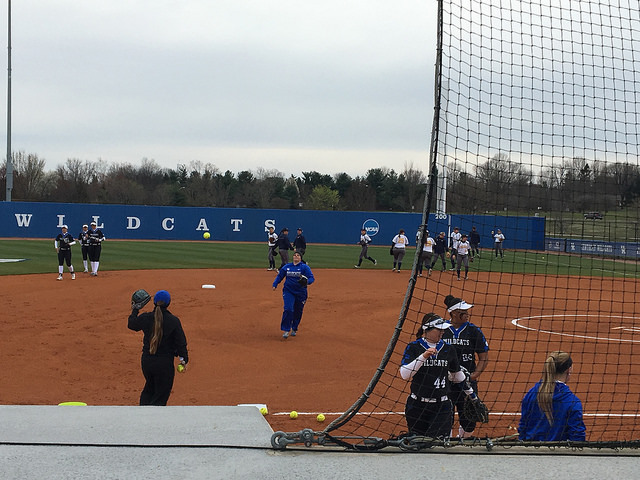 Final: Kentucky 2, Kent State 0. 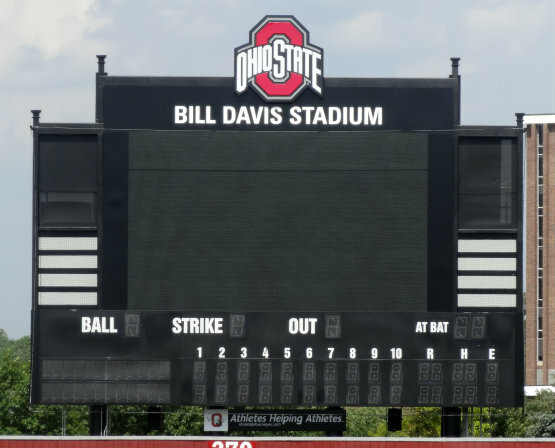 Nick Swisher Field at Bill Davis Stadium/OSU-Columbus, OH: Well, tonight’s the night, when the Ohio State Buckeyes take on the Oregon Ducks for the NCAA national football championship. Not having a horse in the race, I did think it was a good chance to show off a few photographs from my visit to Buckeye country this past summer. We had plenty of time to kill before our Columbus Clippers game, so we decided to check out the campus, and that included their baseball stadium. 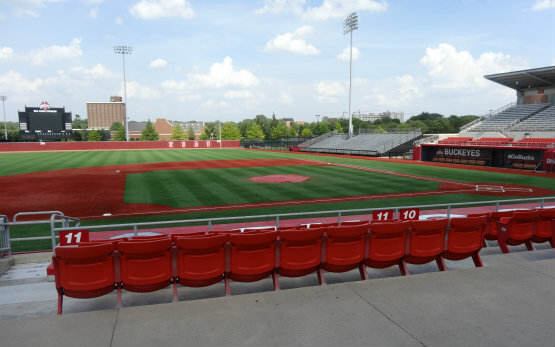 Bill Davis Stadium is really one of the nicest collegiate baseball stadiums that I’ve had a chance to see, though I haven’t been to too many. They have the artificial turf that many of the NCAA teams are going to now, also. I was lucky that they were doing some maintenance work and that the stadium was open for me to poke around and take some pictures. I almost got locked in, though, and I really wasn’t in the mood for climbing fences. 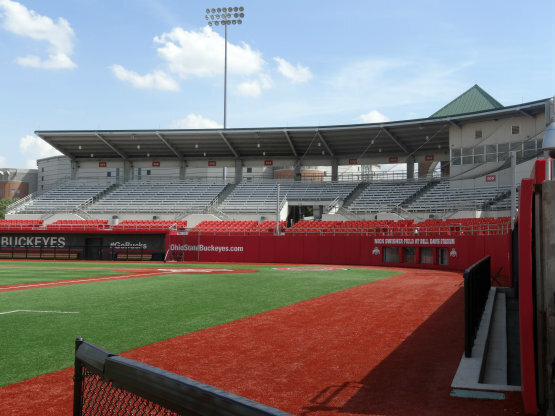 It’s too bad I didn’t get to see a game here, as, again, it’s a really beautiful college ballpark, and I’m sure the atmosphere would have been great, especially if they were playing a rival. Our trip was in mid-June, however, and the only college ball being played at the time was in Omaha. I hope to make it back to Columbus for more baseball to catch a Buckeye game, and another Clippers game, as ours was shortened by some rain. Have fun watching the football game tonight. 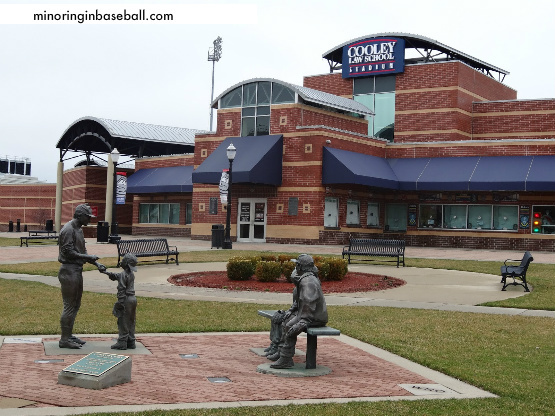 Cooley Law School Stadium-Lansing, MI: Last Thursday we gambled…and lost. 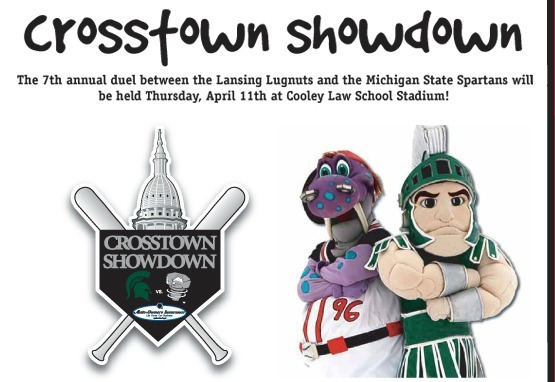 As mother nature continued to punish us in Michigan with freezing rain, sleet, and snow, the 7th Annual Crosstown Showdown, pitting the Lansing Lugnuts against the Michigan State Spartans, has been postponed. 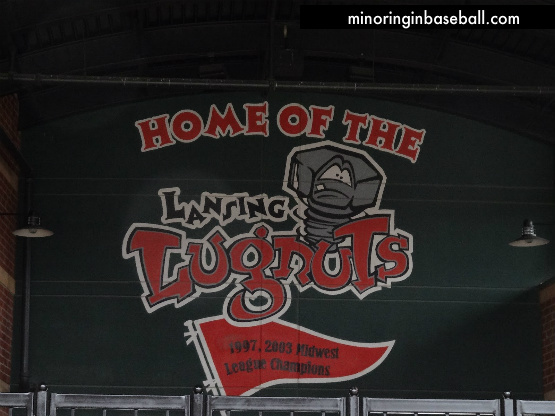 The Lugnuts announced that the game will be made up on May 1st, as a seven inning game. 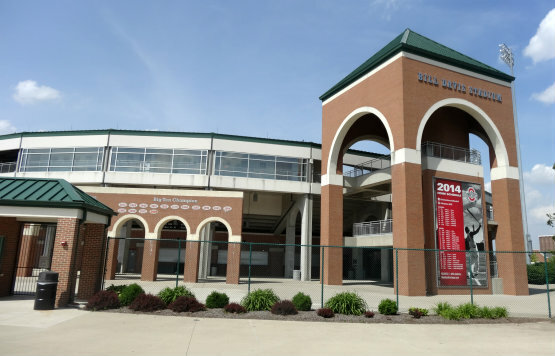 We won’t be able to make it to that one, but the Lansing ticket office staff was more than helpful in helping us exchange our tickets for a game that we will be able to make it back down for…weather permitting. The kids and I still had a fun day together, though. 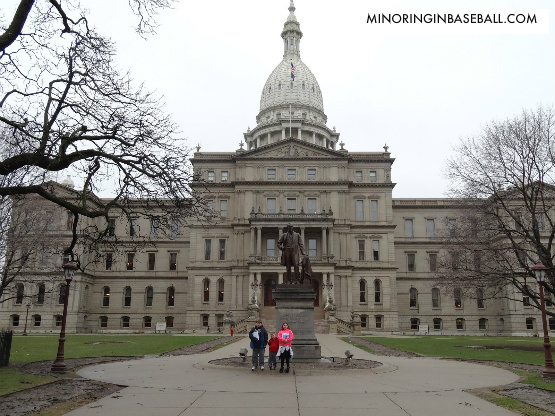 We took a tour of the State Capitol building that was very enjoyable and informative. Lily and Trevor have been studying government in school, and it’s good for them to actually see where and how it’s applied. Our love of cars also took us to see the R.E. Olds transportation museum. We love to see the old cars and memorabilia. So much pride and workmanship went into the classic vehicles. The most fun the kids had was at the Impression 5 Science Center. This is a hands on play area for kids to build, do experiments, and encounter science and nature first hand. They could have spent all day there, and we’ll probably visit this again after the Lugnuts game here in a couple of weeks. It does get you down a bit, waiting for the weather to clear up to see some baseball games, but we still had fun, and the kids were able to spend some quality time with their Papa for his birthday. We also had dinner at one of my favorite sports bars, the Nuthouse Sports Grill! We all know how the song starts….’On a cold winter’s morning..’. And that’s exactly how it felt this morning when my alarm blared in my ear, telling me it was time to get up and get the kids ready for school. Despite being the first day of spring, ‘old man winter’ pounded us with another few inches of snow. Throw the high winds and cold with it, and it’s just another winter storm, complete with low visibility and icy roads. Spring has not sprung, and winter looks as if it wants to stay with us for a little longer. Today was also the day that single game tickets went on sale for the Lansing LugNuts. Here’s where the gambling part comes in.. Despite there being several feet of snow on the ground, and temperatures in the 20’s, I took a gamble and ordered tickets for the Crosstown Showdown on April 11th. I’m sure the grounds crew at Cooley Law School Stadium is working diligently to get the field ready for game action, but there’s still no guarantee what the weather will be like and how cold it will be in just a few short weeks. If it was just me, I wouldn’t care too much, but I’m hoping it’s warm enough for the kids to sit through. I rolled the dice, however, so we’ll see what happens. 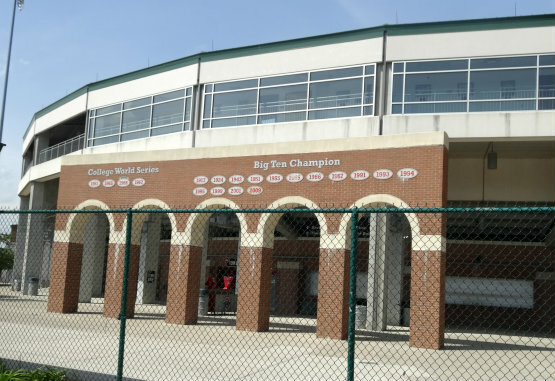 The Crosstown Showdown is the LugNuts opening day exhibition game against the Michigan State University Spartans, based in East Lansing. According to the LugNuts, this is one of the most attended games every season, so I guess we were lucky to get tickets. Trevor is the one who really wanted to see this game, as he’s a Sparty backer, for some reason. It should be a fun day all around, too, as we plan on visiting the State Capitol building while down there, as well as a couple of museums. If I’m going to pull the kids out of school, I have to justify it somehow, right? It should be a good game to watch, also, as MSU is the defending Big Ten champions, and Lansing had a great season last year. So, in a few weeks we’ll pack up and head downstate…and hope that Mother Nature deals us a favorable hand.